BONE THERAPEUTICS (Euronext Brussels and Paris:BOTHE), the bone cell therapy company addressing high unmet medical needs in bone fracture repair, fracture prevention and spinal fusion, today reports positive efficacy data for the Phase IIA spinal fusion trial with ALLOB®. Results of the first half of patients in the study show evidence of successful fusion and important clinical improvements in function, pain and general health as early as six months after treatment and all patients reached the primary and secondary endpoints at the end of the 12-month follow-up period. Spinal fusion is the current standard of care for degenerative disc disease to relieve pain and improve function. However, progression to fusion with current treatments is slow, usually taking 18 to 24 months. Furthermore, the surgery may result in lack of fusion and continuing pain, leaving up to 30% of patients unsatisfied with their surgery. Dynamic x-rays revealed absence of motion of the vertebral bodies (i.e. fusion) in six out of eight patients at 6 months and in all patients at 9 and 12 months. Fusion was further evidenced by CT scans that show the presence of bone bridges as from 6 months in 75% of assessable patients. Back and leg pain improved dramatically, by over 50% and over 80% respectively, as from 6 months throughout the follow-up period. In addition, clinical evaluation demonstrated a 33% improvement in functional disability score (using the Oswestry Disability Index) at six months, which further increased to 40% at 12 months. General health status improved 50% after 6 months and this level was likewise maintained up to 12 months. The Phase IIA trial in lumbar spinal fusion is designed to evaluate the safety and efficacy of the addition of ALLOB® to the standard of care procedure for degenerative disc disease in which an interbody cage with bioceramic granules is implanted to achieve fusion of the lumbar vertebrae. Primary endpoints of the study are radiological evaluation of fusion, improvement in pain and functional disability and safety. The Company was able to demonstrate in preclinical studies that the combination of bioceramics with ALLOB® cells significantly increased new bone formation and fusion in comparison with bioceramics alone. ALLOB® is a first-in-class allogeneic differentiated osteoblastic (bone-forming) cell therapy product developed for the treatment of orthopaedic conditions and bone diseases. Allogeneic cell therapy involves the harvesting of cells from a healthy donor, rather than from the treated patient. ALLOB® is currently being evaluated in three Phase I/IIA clinical trials for delayed-union fractures, spinal fusion and the revision of failed spinal fusions. ALLOB® has been classified as a tissue engineered product under the ATMP regulation 1394/2007EMA and received orphan drug designation from the EMA (Europe) and FDA (US) for two indications, osteonecrosis and osteogenesis imperfecta. Spinal fusion is considered the gold standard surgery for treating a broad spectrum of degenerative spine disorders, including degenerative disc disease to relieve pain and improve function. Spinal fusion consists of bridging two or more vertebrae with the use of a cage and graft material, traditionally autologous bone graft, for fusing an unstable portion of the spine or immobilizing a painful vertebral motion segment. Despite the fact that spinal fusion surgery is routine, non-union and failure to relieve lower back pain are unfortunately still frequent as up to 25 to 30% of spinal fusion patients are not completely satisfied with their surgery. Bone Therapeutics' products are intended to decrease the failure rate of spinal fusion surgeries. Bone Therapeutics is a leading biotechnology company specializing in the development of cell therapy products intended for bone fracture repair and fracture prevention. The current standard of care in this field involves major surgeries and long recovery periods. To overcome these problems, Bone Therapeutics is developing a range of innovative regenerative products containing osteoblastic/bone-forming cells, administrable via a minimally invasive percutaneous technique; a unique proposition in the market. PREOB®, Bone Therapeutics’ autologous bone cell product, is currently in pivotal Phase IIB/III clinical studies for two indications: osteonecrosis and non-union fractures, and in Phase II for severe osteoporosis. ALLOB®, its allogeneic “off-the-shelf” bone cell product, is in Phase II for the treatment of delayed-union fractures and lumbar fusion for degenerative disease of the spine, including a minimally invasive therapy for failed spinal fusions. 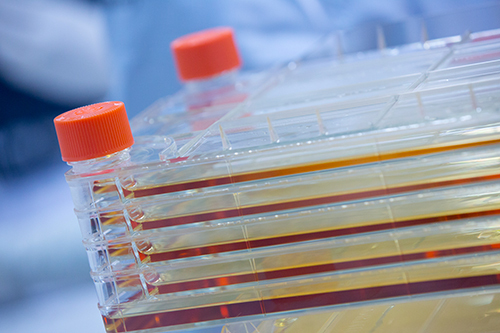 The Company also runs preclinical research programs and develops novel product candidates. Founded in 2006, Bone Therapeutics is headquartered in Gosselies (South of Brussels, Belgium). Bone Therapeutics’ regenerative products are manufactured to the highest GMP standards and are protected by a rich IP estate covering 11 patent families. Further information is available at: www.bonetherapeutics.com.